A box containing fifty menus that once belonged to Chauncey Depew recently came to light. Most of them were from large banquets held between 1888 and 1892. However, the box also contained two simple menu cards, both dated February 17, 1890, that provide a fascinating glimpse into the inner workings of the ruling elite during the Gilded Age. Depew was a persuasive, Yale-educated attorney. Regarded as one of the most outstanding orators of his time, he ranked in the top tier of after-dinner speakers, along with lawyer Whitelaw Reid, retired General Horace Porter, and the preacher Henry Ward Beecher. In fact, Depew was so popular that he spoke at several banquets a week, sitting at the dais for hours before delivering his witty remarks. He enjoyed the camaraderie and acclaim afforded by these engagements, often slipping a banquet menu into his pocket as a souvenir. He regarded public speaking as his hobby. On the afternoon in question, Depew brokered a deal with politicians who came down from Albany. 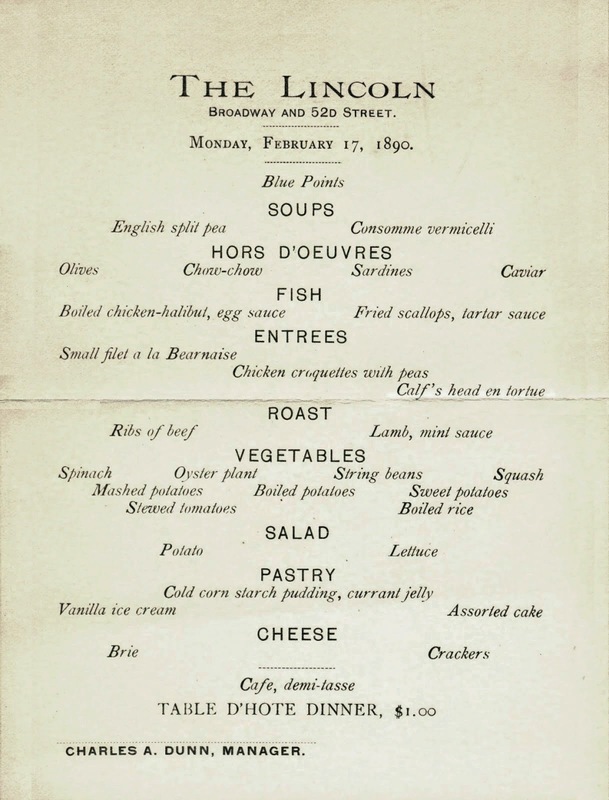 The menu below comes from The Lincoln, a middling hotel where they may have discussed the matter over this midday dinner, featuring the type of everyday fare normally served in such establishments.1 Without knowing its history of ownership, this menu would be of no special interest. In the early evening, Depew gave a rousing speech in support of the fair at a large public meeting at the Cooper Union. In response to charges that the New York Central (which he managed for the Vanderbilts) would profit from the event, Depew estimated that the railroad would only receive about a million dollars of additional revenue, a modest portion of the financial windfall expected to roll into the city. While his masterful performance was fully reported in the newspapers, there was no mention of where he went after his speech. 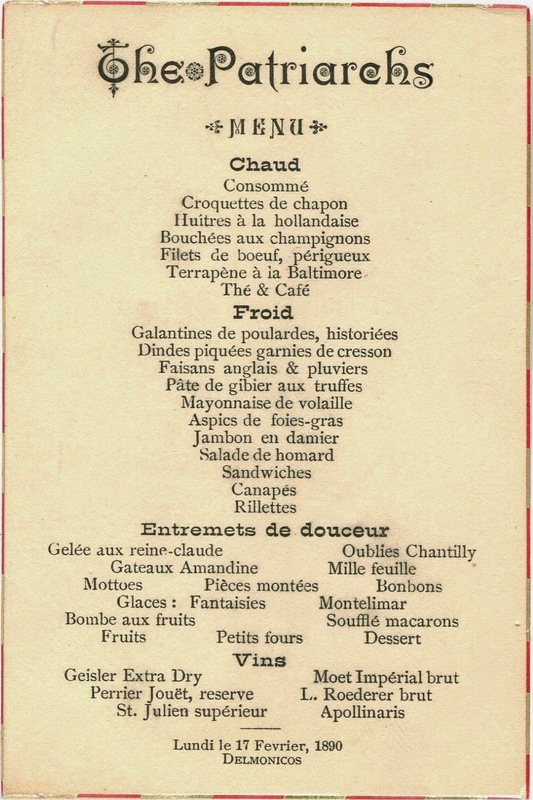 The menu below indicates that Depew later attended a ball sponsored by The Patriarchs, the wealthiest and most exclusive group in New York.2 During the social season, these members of high society attended the opera on Monday nights. After the performance, they took horse-drawn carriages down to Delmonico’s on Madison Square for a late-night dance. At 12:30 AM, a buffet supper was served. Since this break in the program usually created a crush around the small elevator, most people slowly filed down the stairs from the third-floor ballroom to the dining rooms, where fifty tables were waiting for them. The cold dishes were laid out beforehand, carefully arranged so that they could be seamlessly replenished; the warm dishes were served continuously, a few at a time. Distinguished by an alternating red and gilded edge, this elegant menu is printed in a restrained version of the artistic style. Delmonico’s was then at the peak of its eighty-year reign as one of the best restaurants in the country. 1. This hotel predated the much larger Lincoln Hotel (now named the Milford Plaza Hotel) which opened on Eighth Avenue in 1928. 2. 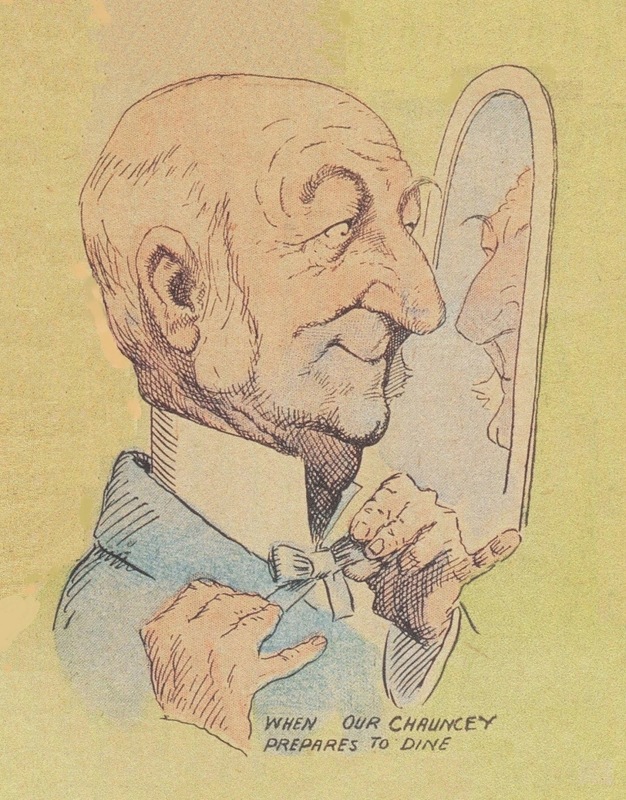 Established in the early 1870s through the efforts of socialite Ward McAllister, the Patriarchs comprised a committee of twenty-five distinguished gentlemen whose purpose was “to create and lead society.” In return for an annual subscription fee of $125, a Patriarch could invite four ladies and five gentlemen to each of their balls at Delmonico’s. These invitations were highly coveted by parvenus anxious to enter the upper echelons of society. The powerful Vanderbilt family, with whom Chauncey Depew had long been associated, was not granted membership until 1888, when Cornelius Vanderbilt II was admitted. The Patriarchs held their last ball in 1897. 3. John Jacob Astor III died five days later on February 22, 1890, making William Waldorf Astor, his son and only heir, the “wealthiest man in the world” according to the New York Times. Although New York failed in its bid for the fair, the 13-story Waldorf Hotel still opened in 1893, six weeks before the World’s Columbian Exposition began in Chicago. 4. Several menus in the box show that Depew visited the Windy City during the inter-city competition, presumably as a trusted intermediary. 5. The New York State legislature appointed U.S. senators until 1914. I can't believe you found a box of his menus Henry. That is remarkable. Provenance is all. I love the way the 2 posts dovetail together so masterfully... the barons of NY duking it out with the rubes upstate and then losing... wonder why they were against having the exposition in NY?? ?